You are here: Home / All Posts / Art/Not Terminal Gallery and Feature Artist Cecilia Mayr! My latest www.culturemob.com article on a killer local Seattle art gallery and it’s latest show. 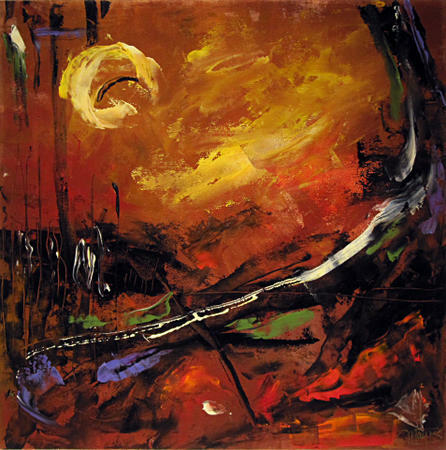 This month’s serving of art at Art/Not Terminal Gallery (hereon in known as A/NT), an all-volunteer, artist-run gallery here in Seattle, WA, features artist Cecilia Mayr and her exhibition Echo of Colors which is showing now until December 1st. “Echo” is as interesting an art show as the A/NT gallery is large, sprawling and intriguing. "Generations 1" by Cecilia Mayr. All rights reserved. « THUNDERBIRD is coming! The New Exhibition by Primal Artist Obi Kaufmann!